With a seemingly endless stream of festivals, events, and happenings around us in Seattle and the rest of the Northwest, it is no surprise that there are several highlights to remember from the past year. These are just a few events that rocked the house in 2009, and it doesn’t even come close to listing all the beer events that I enjoyed over the year. Fresh Hop Ale Festival in Portland – If you’ve been visiting my site for a while, you realize how much I love fresh hop beers. Just a $60 round trip, 3-hour Amtrak ride down south led me to one of my favorite beer weekends of the year. The highlight festival itself featured around 30 or 40 fresh hop beers, but there were also special fresh hop beers on tap at bars and brewpubs all over town. We sampled a ridiculous amount of good beers in about 36 hours. In comparison with Washington, a larger volume of Oregon brewers seem to embrace the fresh hop beers, and there is definitely better organization as far as getting a bunch on tap at once at a bar (like Belmont Station) and putting together a great festival. The Yakima Fresh Hop Ale festival is a fun event, but I’d love to see something for us city-folk in Seattle. Seattle Beer Week– In Seattle, you sometimes run into days/weekends where you have to pick one event over another. But, during the first annual Seattle Beer Week, it seemed like we were having to choose from two or more worthy events on each night for a ten day stretch. The first year of the celebration was a great time and a definite success (at least from a consumer’s point of view). My highlight of the week was the Sour Fest at Brouwer’s. 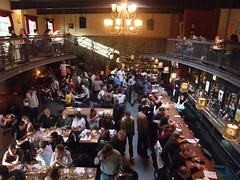 You can look forward to this year’s bigger and better Seattle Beer Week coming up from May 13 to May 23. Oregon Brewers Festival Weekend– The OBF is always a great time. Especially for someone who doesn’t live in Oregon, there were plenty of great beers at the festival I had never had before. In addition to the festival though, this is a great weekend to visit many of the local Portland establishments. One thing I didn’t like about the festival this past year was the format and extra admission for the “Buzz Tent”. Suggestion for next year: rather than have a separate punch card you have to purchase, just charge 2 or 3 regular tokens for the rare beers. Keep them in the separate area still, but don’t force me to buy 8 samples if I just want 2 of the beers pouring in the tent at the time. I wasn’t interested in paying $20 extra when there were plenty of other things pouring at the fest to keep me interested. Washington Beer Fest at Brouwer’s and the Naked City Anniversary Celebration– The first Washington Beer Fest at Brouwer’s Cafe combined with the Naked City Taphouse one year anniversary celebration over the same weekend in October meant there was lots of great, local beer flowing. Both bars switched all of their taps to beers from Washington breweries, which meant Brouwer’s had 60+ WA beers on tap, and Naked City had about 25. Both establishments managed to procure kegs from breweries that we rarely, if ever, see in this part of the state. Mix those rare beers with seasonals and special releases from other favorite WA breweries, throw in some solid standards, and you’ve got the making of a pretty epic weekend of WA beer drinking. Big Wood Festival at Brouwer’s and the Washington Winter Beer Festival– Both of these events took place over the same weekend in early December, and the combination made for another of my favorite beer drinking weekends of the year. Big Wood has probably become my favorite Brouwer’s festival, and the Winter Beer Festival had some great beers from all Washington breweries. Throw in a tasting of all but the first vintage of Stone’s Vertical Epic Series at our friends’ house, and I drank a ridiculous amount of great beer that weekend. Beer Trippin’ Out East – This one is obviously a personal trip. Jeanne and I headed out to visit Washignton, DC and Boston this past summer, and we hit several beer stops in both cities. I had never been to either location and I really enjoyed myself and can’t wait to go back. Highlights were Pizzeria Paradiso in DC, and Cambridge Brewing in Boston/Cambridge. Both were outstanding beer joints in my book. Not even a mention of Operation Save Walter? You’re right, Bri. We drank some insane beers during Operation Save Walter. I don’t think any readers want to hear about what else went on that weekend though.